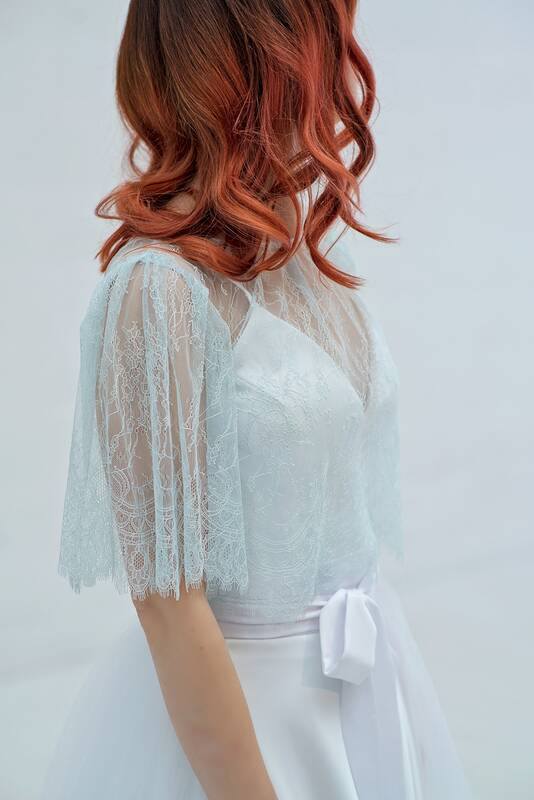 This is a transparent, unlined, delicate and soft chantilly lace cover up with flutter sleeves and a cropped at the waist, loose fit design. Can be worn over a strapless wedding dress, over a bustier or a corset, or just a bra for a bold bohemian look. 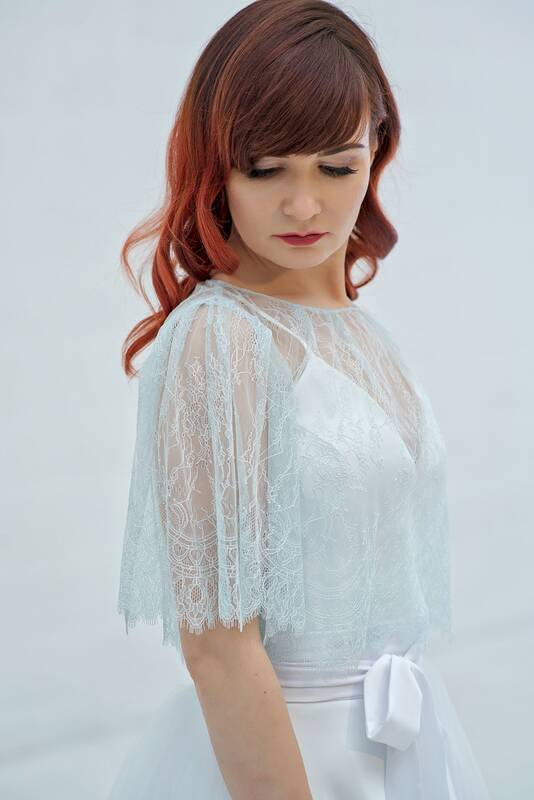 It is photographed over our Vivian top, but will look great over Heather corset, any camisole of ours, Faerie or Nora bodysuits. The sleeves are shown elbow length, but their length is totally custom and for you to choose. Shown color is a hand dyed ice blue shade, but it can be made in pretty much any color you can imagine (we make and mix our own dyes), and can be matched to any of our items. You can also order it in pure white or ivory. If you have any questions about them, please do not hesitate to ask us and we will be there to help you! The top will be shipped to you via DHL Express Worldwide, please also give us your phone number for shipping either in the notes to seller section or via separate Etsy conversation message. The shipping is easy to track at every step, and usually takes 2-5 days to arrive. We accept PayPal, credit cards and many more options that you can find when checking out. We are using DHL express worldwide - it is a very reliable 2-5 working days shipping service with a step by step tracking system that actually works. Please kindly provide your phone number for the couriers. There are no additional customs charges for buyers from EU member states. There are no additional customs charges for United States buyers of under 800$ (USD). There are no additional customs charges for Australia buyers of under 1000 AUD. There will most likely be additional customs charges for buyers from Canada, Switzerland and rest of the world, depending on the laws of your country. We are not to blame for the customs charges or duties you may have to pay, as those are the laws of your country. We cannot mislead customs by marking low values or anything of a sort, because we are a registered VAT payer and our export documents must be valid and presentable. Every item is custom made from scratch to each customers measurements, therefore returns for a refund are not offered. Nobody else can wear your garment as it was made just for you. Minor alterations are a normal expectation everywhere in the bridal garment industry, us included. If we make a mistake or send you a somehow faulty product - we will certainly take responsibility and offer a suitable solution (e.g alter it ourselves, pay for alterations on your end, send fabric, etc, whatever is needed to solve the problem). Kindly take notice, that complaints are welcome within a week after delivery and will not be considered past that time. Please read our FAQ to find out more details about which items are most likely and least likely to need alterations. Please do not be under impression, that since these are made to measure, you will definitely need no futher (local) alterations to make sure the garments fit like a glove. The more fitting the garment - the more likely you will need alterations, besides the measurements themselves, posture is also important for such items. All bodysuits are expected to need further altering, please take note, if you are ordering Faerie, Nora, Grace, Indra, Dolores, Tulia or Yona bodysuits - it makes sense to book a tailors appointment for after your delivery. Please contact us within a week post delivery for a solution. A statement "this garment piece doesn't fit" is unfortunately not a claim we can consider. If, for example, your skirt is too short for you, too wide, or too narrow, please kindly measure it, compare it to the measurements you gave us, and if a discrepancy is indeed found, please send us photos that show it (measuring tape around your body, measuring tape across the garment (we are happy to tell you how to measure the garment if you are not sure and need assistance). If we indeed are to blame for the ill fitting garment, beyond the extent of expected nips and tucks on the bodysuit or a tight fitting top we covered before, we will absolutely be of service of solving the problem. We will either pay for alterations on your end, send you a new garment or just a part of it (e.g, new sleeves), take it back to alter ourselves. Please be advised, that nearly every tulle, lace or chiffon color (with very few exceptions, such as whites) is a hand dyed one. Therefore every garment is unique and slightly different. For example, if you ordered a "Dusty pink" color skirt before, and would ask us to make another, that would match the first one by 100%, we could not guarantee that. If you need more than one skirt in exactly matching tonal shades, you need to order them all at once, for example, for a bridesmaids party. In that case we are able to make them exactly identical in color. The color chart is a general and a pretty good idea of a color you'd be getting, but it shows the color in a "swirl of tulle", and every skirt does still come out unique in a way, especially when lining and waistband is added. For some specific and exact color, photo references are always welcome and we do successfully recreate colors of it to major extent. For an exact color match, please mail us a sample and we will make sure your new item will match the rest of your outfit. To fulfil your order, you must provide me with certain information (which you authorized Etsy to provide to me), such as your name, email address, postal address, payment information, and the details of the product that you’re ordering. You may also choose to provide me with additional personal information (for a custom order, for example), if you contact me directly. - Service providers. I engage certain trusted third parties to perform functions and provide services to my shop, such as delivery companies. I will share your personal information with these third parties, but only to the extent necessary to perform these services. - Business transfers. If I sell or merge my business, I may disclose your information as part of that transaction, only to the extent permitted by law. - Compliance with laws. I may collect, use, retain, and share your information if I have a good faith belief that it is reasonably necessary to: (a) respond to legal process or to government requests; (b) enforce my agreements, terms and policies; (c) prevent, investigate, and address fraud and other illegal activity, security, or technical issues; or (d) protect the rights, property, and safety of my customers, or others. I may store and process your information through third-party hosting services in the US and other jurisdictions. As a result, I may transfer your personal information to a jurisdiction with different data protection and government surveillance laws than your jurisdiction. If I am deemed to transfer information about you outside of the EU, I rely on Privacy Shield as the legal basis for the transfer, as Google Cloud is Privacy Shield certified, TRUSTe Privacy Certifications. - Access. You may have the right to access and receive a copy of the personal information I hold about you by contacting me using the contact information below. - Change, restrict, delete. You may also have rights to change, restrict my use of, or delete your personal information. Absent exceptional circumstances (like where I am required to store data for legal reasons) I will generally delete your personal information upon request. - Object. You can object to (i) my processing of some of your information based on my legitimate interests and (ii) receiving marketing messages from me after providing your express consent to receive them. In such cases, I will delete your personal information unless I have compelling and legitimate grounds to continue using that information or if it is needed for legal reasons. - Complain. If you reside in the EU and wish to raise a concern about my use of your information (and without prejudice to any other rights you may have), you have the right to do so with your local data protection authority. What size are Wardrobe by Dulcinea clothes? They are made to your measurements. We have extensive video tutorials showing how and where to measure - and you can also simply take our measurement list from the video description to any tailor if you do not wish to attempt measurements at home with a help of a friend. Many do it at home though and it turns out just fine - we usually spot an error if any occurs. How do I submit my measurements? Due to our crafting queue, we do not need your measurements at the time of the order - you can purchase the listing to reserve the timeline and fabrics, and provide them within couple of weeks or even more, depending on your own deadline (we need 4-8 weeks post measurements once crafting queue is up, depending on the volume of the order). If you have them ready though, you can simply paste them in the "Notes to seller" section, you will find this in your cart when checking out. Alternatively you can just message Inge on Etsy and give her the list of measurements at any time you wish. I know this is the dress I want, but my wedding is in 6 months, a year, or more. Will the listing still be available then? We cannot be sure of that, as there can be many reasons to discontinue a product, most important of which is - fabric supplier discontinues a certain fabric. Therefore we strongly advise and encourage placing your order early to reserve the fabrics we have in stock, as well as the timeline, for when you are ready to provide your measurements. We can wait as long as you need, just leave us 4-8 (depending on the volume of order) weeks to make the garments after you provide your measurements. Can a certain top, skirt or a dress be made in custom color? Most likely, yes, but please do write to us and send a color reference photo along with your inquiry. Simply naming the color (e.g. "blush") is not enough, because there can be dozens of blush shades, and you and I can imagine different ones. We want you to have just the shade you love and want to wear. Most materials we hand dye - tulle, lace, chiffon - therefore multiple color variations are available, as well as ombre and layered effects. Do you accept rush orders? How much extra does it cost? Only if we are able to. Please message us with your deadline and location and we will be able to tell you right away if we can meet it. We do not charge anything extra for rush orders - we are either able to schedule it in or we are not, and we already use DHL Express Worldwide shipping for your garments and it takes mere days to be delivered, so there is nothing to upgrade in that regard. How are your clothes made? Do you use any production partners? How long is the production of a specific item or two? Current production for default items (any one skirt or any one top, separately) is 10 weeks and up to 5 days to ship. Please order 11 weeks ahead and let us know the date. Two piece wedding dresses or any two items ordered at once take about 4 months to produce, so reserve at least 4 months and a week to receive a two piece garment. More items than two at a time needed? Please present your deadline and we will inform you if it can be met. Extra time is needed for custom color or design modifications. Inquiries welcome. We may accept rush orders as well (if we are able to), please message us with the dates you need the garments by, before purchasing. It depends on what you getting. Highly unlikely (unless you provided wrong measurements or gained/lost weight) if you are getting just the skirt. For tops: about 30% of a possibility to need some alterations, more likely for a tight fit than a loose fit model. Very likely to need alterations (IMPORTANT to take note) - for all bodysuits, as they should be fitted during production. 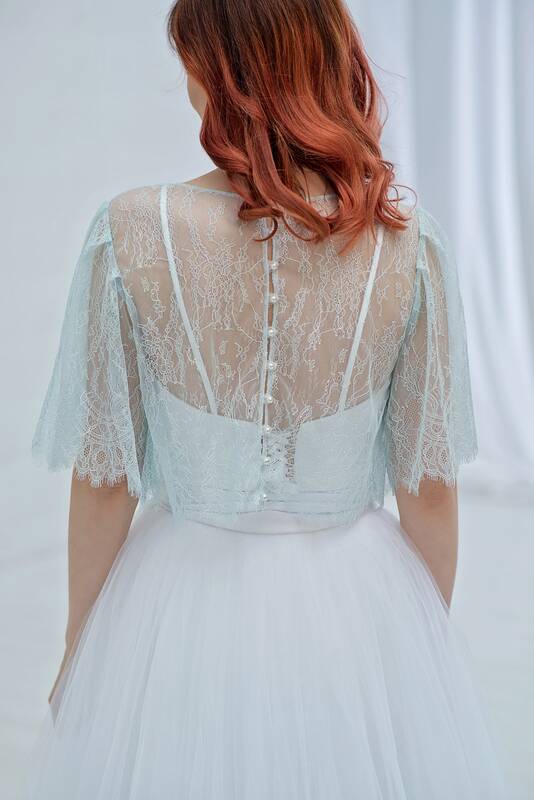 If you are ordering Dolores, Grace, Faerie, Nora, Yona, Indra bodysuits - please make sure you have a tailor available before your big day, after arrival of your order. We can inform you of an exact time you will be receiving your garment.